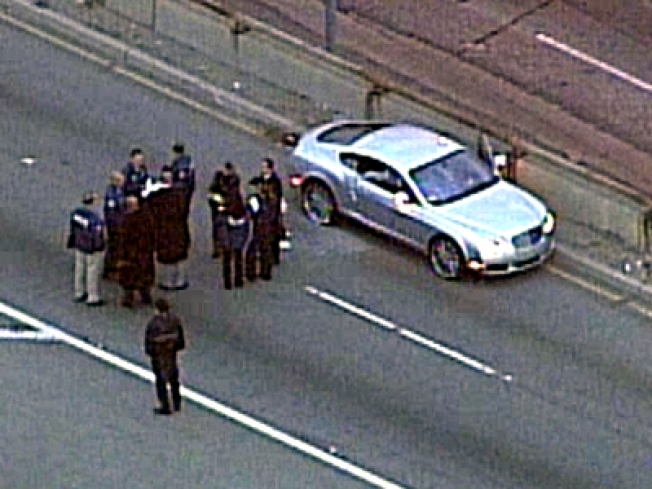 The driver of a new, silver Bentley Continental was critically wounded in a freeway shooting that left the $170,000-plus car riddled with bullets early Friday, police said. Police said Friday afternoon that the man was not expected to survive. The driver, a 25-year-old man whose name was not immediately released, was wounded around 3:30 a.m. on the southbound 101 Freeway in the Boyle Heights area just south of downtown, police said. He was hospitalized in critical condition. Traffic comes to a standstill as authorities investigate a shooting on the 101 Freeway in Boyle Heights. The shooting investigation prompted the closure of all southbound lanes of the 101 Freeway at the Pasadena (110) Freeway, CHP Officer David Porter said. Traffic remained backed up on the freeway over six hours later and nearby surface streets were closed, frustrating morning rush-hour drivers. California Highway Patrol officers were called to the center median of a freeway connector to the eastbound San Bernardino Freeway. Lt. Paul Vernon said the car was hit with at least 10 bullets. "The driver inside was slumped over his steering wheel. He had been shot multiple times," Vernon said. The car apparently was targeted as it was moving but it was unclear whether the attacker was in a pursuing car or fired from someplace off the freeway, Vernon said. The silver Bentley had only paper dealer plates. Depending on the model and options, new Bentley Continentals sell for between $170,000 and $200,000.